This might not come across as overly surprising, but as it turns out, there aren’t a ton of machined tool enthusiasts out there (well, at least none like us here at Protocast Inc.). While rapid prototyping is our main specialty, our Denver foundry can machine specialty tools down to whatever your specifications are. From the automotive industry to robotics, we’re proud to serve the Front Range of Colorado for whatever your tooling or rapid prototyping needs are. Forging Tools At Protocast Inc. In a fun deviation from our traditional blog posts, we’re actually going to look at a few movies that feature machined tools. While Hollywood tends to glamorize characters that revolve around banking, law, and politics, what about the importance of forging tools? This bedrock, foundational skill of civilization is a way of life for millions of people and it’s nice to see films that embrace this reality. Anyway, let’s dive into some of these films as they relate to our machine shop and metal foundry. In this George Clooney flick, an assassin named Jack is dispatched to a small town in Italy by his handler, given the task of building a custom rifle to be used for a special job. Not to spoil anything if you haven’t seen this movie, but here’s the twist: the intended target is himself. Whoa! As Jack assembles the rifle, he is seen meticulously and carefully working in complete silence, making sure that the tool is constructed with absolute precision. At one point in the tooling process, Clooney’s character must hammer the washer components into place. In order to disguise the sound of his hammer blows, he times them to coincide with the ringing of the local church bells. This sound ominously suggests his own approaching doom. Sure, we don’t make rifles at Protocast Inc., but this does make for an interesting movie plot to us. With a name like “The Machinist,” you just know that this movie is up our alley. Christian Bale plays Trevor Reznick, a machinist in a tool and die shop who suffers from severe insomnia. The story itself is very interesting, featuring a frail, thin main character who’s on the verge of a complete nervous collapse. In the midst of this mental degradation, we do see Bale’s character at his lathe and turning handles on a vertical mill. This is no doubt a bad sorry of decaying mental health, but it’s a role from Bale worth checking out. Yes, John Rambo is certified B.A. Did you know that John Rambo knows how to forge his own steel? Well, he does in the 2008 Rambo flick. In the story, a group of Christian missionaries is taken prisoner by a local warlord in Burma, so Rambo must fire up the forge and create a new blade out of a leaf spring. Tune In For More Machining Films! 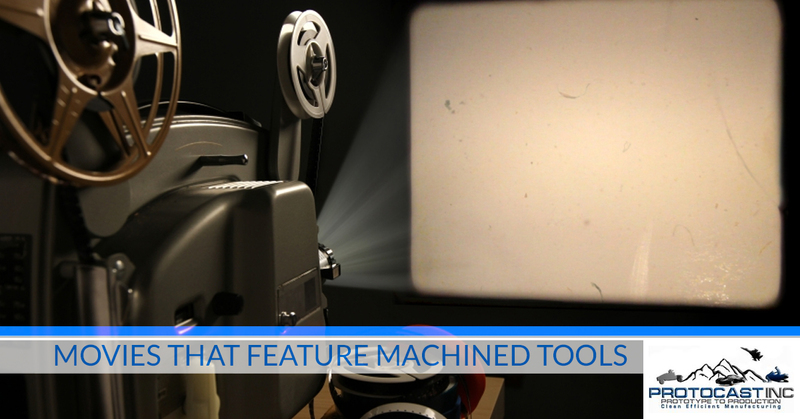 We’re excited that there are some films out there that feature machining tools in action. There are more movies to be covered, so stay tuned for another post from our Denver foundry.